How did culinary arts become your career? To be completely honest, I was kind of forced into the culinary world very early in life. When my older sister eventually moved out, that left me in charge of the household. My mother worked nights so when we got out of school, my mother would be on her way to work. I had to make sure we ate dinner. After learning from my grandmother and watching her cook on the weekends, I began to experiment in the kitchen and try my hand at it. It actually backfired on me because my brother began to like my food better than my mother’s. I literally became the cook of the house. This lead to me enrolling in Eastern Vocational Technical High School to study culinary arts and restaurant management. Food is a common factor in many life situations. Lose your job. Let’s go eat. Got a new job. Let’s go eat. Meet a girl. Let’s go eat. Someone died. Let’s go eat. Someone is born. Let’s go eat. I realized early in life, we can’t go without food. I wanted to be part of the good and bad times of life and maybe my food could make someone feel better. How did you become a Food Network star? Food Network contacted me about competing on the Great Food Truck Race. At the time, I had a GoFundMe fundraising campaign to raise money for a restaurant, and instead, got a opportunity to compete on the show. Next, my apartment in Atlanta caught on fire when a friend made a crucial mistake of throwing frozen fish into piping hot grease and caused a fire. I had to move out of the apartment. So, I went to San Francisco and waited for the follow up call for the show. When I did get the call, it was to inform me that I was selected in the final round and they would reach back out. I explained to the casting agent that I had moved to San Francisco believing this opportunity would change my life. She referred me to Guy’s Grocery Games where I was eliminated in the 1st round after cutting my hand from being super nervous. Then, I got cast for Cutthroat Kitchen where I won the show and $9,600. It was incredible to win the show. My family finally got to see what I have been working so hard on. My children got to see dad on TV. The phone lines and social media exploded. I was able to secure interviews, guest appearances on other shows, and the respect I rightfully was seeking amongst chefs in the industry. I’ve cooked for Guy Fieri, Richard Blais, G Garvin, Chef Aarti, Chef Antonia, and Alton Brown. That amazing feedback was a confidence booster. Think about the fact that there are four contestants per episode, maybe 15 shows a season and, so roughly, 100 people get called out of the four million that apply. It’s unexplainable and to this day I still get emails about the show from all across the world. Transition Kitchen is my give back to the city that raised me. As things began to unfold and I felt that I would be a millionaire soon, I wanted to create a system and program - a blueprint for others to follow - to offer a solution to some of the inner cities biggest problems. However, I realized that it could take longer than I expected and without the ability to finance it, I decided to use what resources I had and what money I could afford to invest in what will be a multifaceted culinary arts program for youth, young adults, and returning citizens of Baltimore. Growing up in the hood, in all honesty, I glorified the wrong things. Society makes a basketball player or football player look so great. Even the newest rapper had me wishing that I had money to do the same things they could do: live how they live, drive the cars they drove, be seen with the woman they dated and married, but not having the body type for the NFL, the NBA, nor the ability to rap, left few options. Sad but true, like many, I thought being able to live like the drug dealers, who literally had all of the things I wanted, could be a way to make it out. After dancing with the devil and trying my hand, after a few arrests here and there, a few friends dying or going to jail, and almost being killed in a robbery, I decided that culinary arts was my way out. From that moment, I gave it everything I had, and thank God, it worked for me. I’m now dedicated to making it work for someone else. Though many become a product of their environment, Transition KitchenTM is a resource center designed to help change the narrative and inspire many brothers and sisters that there truly is another way…and I intend to show them. Through my program students, aged 16 and older, will take classes to learn the industry. Top students will help train the next cohort. What’s next for Transition KitchenTM and Chef Stew? After actually launching my first Transition Kitchen and after years of hard work to make this happen, I really want to pick up on a personal goal I have yet to achieve which is to open my first restaurant. I detoured off the trail to do what I felt was a collective goal. Many of my accomplishments were personal, but this accomplishment [Transition KitchenTM] was for an entire city to be apart of. Truthfully,Transition KitchenTM belongs in several other cities. Additionally, I am looking to partner with other programs that will enhance and strengthen my efforts. Chef Stew will continue cooking for celebrities, corporations, and making TV appearances. Ultimately, I just want students to understand the endless possibilities that the industry provides. What would you do if you weren't a chef? I would be competing on Jeopardy! weekly, or be an astronaut, or an attorney. I love brain games, space, universal law, and helping other people win. 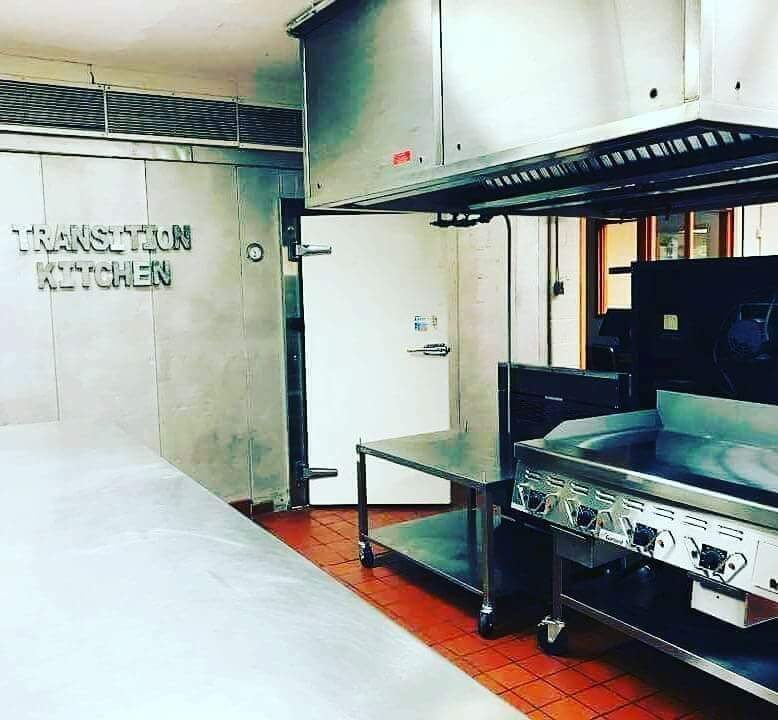 To learn more about Transition KitchenTM latest fundraising campaign, visit https://www.gofundme.com/registration-kits. For more information: visit www.chefstew.com, follow @TransitionKitchenbmore on IG, like Transition Kitchen Bmore on Facebook or send an email to transitionkitchenbmore@gmail.com.